Abney phenomenon. “change of hue produced by decreasing the purity of a colour stimulus while keeping its dominant wavelength and luminance constant” (CIE e-ILV 17-1). Achromatic colour. Perceived colour lacking hue (CIE e-ILV 17-11), as in white as a colour of light and white, grey and black as colours of diffusely-reflecting objects. Achromatic transparent and specular metallic objects are usually described as colourless. See also neutral. Adaptation. Any process by which perception is influenced by previous and present exposure to stimuli (CIE e-ILV 17-18), for example light adaptation and dark adaptation for states of adaptation to moderate (and greater) and very low illumination levels respectively (CIE e-ILV 17-20), collectively included under brightness adaptation. Chromatic adaptation is the "visual process whereby approximate compensation is made for changes in the colours of stimuli, especially in the case of changes in illuminants" (CIE e-ILV 17-140). See Part 3.3. Additive mixture of colour stimuli. “stimulation that combines on the retina the actions of various colour stimuli in such a manner that they cannot be perceived individually” (CIE e-ILV 17-24). Often loosely called "additive colour mixture". Additive mixture includes both simple additive mixture of superimposed light beams or of light from the RGB subpixels on a screen in which the stimuli are seen as being summed, and additive-averaging mixture in which the component stimuli are seen as being averaged over an area. See Part 4. Additive-averaging mixture. “a form of color-stimulus synthesis in which the result is an average of the components rather than the sum” as in simple additive mixing (Burnham et al., 1963, as averaging color-stimulus synthesis). Examples include reflective stimuli that are moving too fast (e.g. spinning discs) or too finely interspersed to be distinguished. See Part 4.4. Afterimage. Visual perception persisting after cessation of the stimulus, including positive and negative afterimages. Analogous colours. In traditional colour harmony, colours similar to each other in hue. Assimilation. Convergence of perceived colour observed when small areas of colour are interspersed. See Part 3.5. Atmospheric perspective. Progressive change in appearance of objects with increasing distance, due to increasing thickness of air intervening between the object and the observer. See Part 10.8. Bezold-Brücke phenomenon. “change of hue produced by changing the luminance (within the range of photopic vision) of a colour stimulus while keeping its chromaticity constant” (CIE e-ILV 17-86). For example, single wavelengths of the spectrum shift in hue towards either blue (below 500 nm) or yellow (above 500 nm) as they become brighter. Blackness. In NCS terminology the blackness of an object colour is" the perceived amount of black in the colour relative to pure black." See Part 1.8. Brightness. 1. “attribute of a visual perception according to which an area appears to emit, or reflect, more or less light. NOTE The use of this term is not restricted to primary light sources” (CIE e-ILV 17-111). Brightness is our perception of physical luminance, as conditioned by the brightness adaptation of the observer and by contrast phenomena and assimilation. See Part 1.6. 2. With respect to object colours, commonly used in the sense of brilliance or freedom from blackness. White, peak-chroma colours and all tints in between are all described as "bright" in this sense. 3. Brightness “B” in HSB colour space is a simple computation of brightness relative to the maximum possible for digital colours of a given hue and saturation. Brilliance. A scale of colour appearance along which related colours pass with increasing brightness from the black threshold through decreasing degrees of black content through a point of zero blackness (or “zero greyness”) to a fluorent (fluorescent looking) and ultimately self-luminous appearance. See Part 1.8. Broken colour. 1. Paint application displaying visible colour variants, as opposed to solid or uniform colour. 2. Partly neutralized paint colour. “Chalky” colour. Colour felt to exhibit too much whiteness for its context in a painting (compare "muddy" colour). Chromatic colour. Colour having a hue. Chromaticity. 1. In CIE terminology “property of a colour stimulus defined by its chromaticity coordinates, or by its dominant or complementary wavelength and purity taken together” (CIE e-ILV 17-1444). Chromaticity describes the psychophysical colour of a light, independent of its intensity (luminance)..
2. Sometimes loosely used for chromatic intensity of some kind, such as chroma, saturation or colourfulness. Chromaticness. In NCS terminology, perceived proportion of pure chromatic colour considered as a component of an object colour along with black and white. See Part 1.8. Chromostereopsis. Perception of depth evoked by differently coloured areas on the same plane (Wikipedia). Most observers see red objects “advance” and blue object “recede”, although a minority see the reverse. CIE (Commission Internationale de l' Eclairage). The International Commission on Illumination or Commission Internationale de L'Eclairage was founded in 1913 and is the organization responsible for the international coordination of lighting-related technical standards. In the field of colour the CIE established the fundamental framework of modern colorimetry including the CIE 2o and 10o standard observers, the CIE standard illuminants (Illuminants C, D50, D65 etc), various widely used colour spaces including CIE XYZ, CIE xyY and CIE L*a*b*, colour difference formulae (CIEDE94, CIEDE2000), and colour appearance models including CIECAM02. Its International Lighting Vocabulary lists definitions for 1448 terms and is by far the most comprehensive and authoritative source on the scientific terminology of light and colour. CIE L*a*b* colour space. Three-dimensional, approximately uniform colour space produced by plotting in rectangular coordinates L* (CIE lightness) and a* and b* (chromatic coordinates corresponding roughly to reddishness/greenishness and yellowishness/bluishness respectively). See CIE e-ILV 17-157. An implementation of CIE L*a*b* called Lab space is of central importance in Photoshop and some other graphics programs. CIE L*u*v* colour space. Three-dimensional, approximately uniform colour space produced by plotting in rectangular coordinates L* (CIE lightness) and u* and v* (chromatic coordinates corresponding roughly to reddishness/greenishness and yellowishness/bluishness respectively). See CIE e-ILV 17-159. CIE xyY colour space. Colour space produced by combining the dimension of luminance (Y) with the CIE xy chromaticity diagram. Colorant. Dye, pigment, or other agent used to impart colour to a material (CIE e-ILV 17-191). 2. Psychophysical colour: “specification of a colour stimulus in terms of operationally defined values, such as 3 tristimulus values” (CIE e-ILV 17-197). Note that the same psychophysical colour, for example specified by a set of RGB values, can appear as different perceived colours when placed in different contexts.See also luminous colour, nonluminous colour, object colour. 3. Colloquially a coloured pigment, paint, etc. Colour appearance model. Mathematical model designed to predict various attributes of the perceived colour of an object from its colorimetric specification, using various assumptions and various kinds of information about the viewing conditions. Colour constancy. The term colour constancy is not defined by the CIE and has been used in quite diverse senses. One aspect of colour constancy is the ability of our visual system to perceive an object as having a relatively stable intrinsic object colour despite variations in appearance due to variations in brightness and colour of illumination, surround and intervening atmosphere (referred to here as object-colour constancy, see Part 11.6). Some authors use the term instead or as well to include brightness and chromatic adaptation. Colour harmony. Relationship of colours deemed to be aesthetically pleasing, often codified in traditional colour theory into rules concerned with hue relationships. Colour mixing. Colloquial term for light or colorant mixture, including additive, additive-averaging and subtractive "colour mixing". Colour model. Widely used term for non-colorimetric colour spaces such as generic "RGB" (e.g. Wikipedia). Colour space. 1, In CIE terminology a colour space is a "geometric representation of colour in space, usually of 3 dimensions" (CIE e-ILV 17-226), and a colorimetric colour space is a "colour space defined by 3 colorimetric coordinates" such as CIE XYZ or sRGB (CIE e-ILV, 17-193). 2. An alternative usage restricts the term "colour space" to colorimetric colour spaces and refers to non-colorimetric colour spaces as colour models. Colour string. A sequence of paint mixtures on a palette varying systematically in colour in some way, for example of increasing white content, or of successive value steps for a given hue and chroma. Colour symbolism. The use of color as a symbol in various cultures (Wikipedia). Most colours have a wide range of often contradictory associations, generally both positive and negative, even within a single culture. Colour temperature. 1. “temperature of a Planckian radiator whose radiation has the same chromaticity as that of a given stimulus” (CIE e-ILV 17-231). In this sense, reddish and yellowish lights have low temperatures and bluish lights have high temperatures. 2. Sometimes used in traditional colour theory for the classification of colours into "warm" and "cool". These psychological associations have a broadly opposite polarity to Planckian colour temperature (reddish and/or yellowish colours are generally considered warm and bluish. greenish and greyish colours usually considered cool) but are subjective and inconsistent: the warmest hue ranges from yellow to red and the coolest hue ranges from blue-green to violet in different traditions (Part 7.7). Colour wheel. Term used in traditional colour theory for a circular diagram of hues. Colourfulness. “attribute of a visual perception according to which the perceived colour of an area appears to be more or less chromatic” (CIE 17-233). See Part 1.6. Complementary. An opposite or “completing” colour or hue, such as an additive, afterimage or paint-mixing complementary. Complementary, additive. Hue of a light that will mix to make white light with light of a given hue. Additive-complementary lights have an exactly opposite dominant wavelength or direction of bias relative to daylight. Because hue pages curve somewhat on a chromaticity diagram the concept of an additive complementary hue is inexact on a very fine grained level, but precise additive complementaries usually lie less than one Munsell 40-hue step away from the opposite Munsell hue. See Part 4.3. Complementary, afterimage. Hue of the negative afterimage of a colour stimulus. Afterimage hues of yellowish hues are more purplish and of orangeish hues less greenish than the additive complementary, whereas in other hue sectors the two essentially coincide (Wilson and Brocklebank, 1955). Complementary, paint-mixing. Hues of two paints that physically combine to make a neutral (black or grey) mixture. See Part 7.5. Complementary, split. In traditional colour theory, combination of a colour with two near complementaries, often the two colours adjacent to the complementary on a 12-hue “colour wheel”. "Cool" colours. Colours deemed in traditional colour theory to have a psychological association with coldness (see "colour temperature"). In various accounts the coolest hue ranges from violet through blue to blue-green. Cyan. 1. The greenish blue hue of cyan printer's inks, generally based on the pigment phthalocyanine blue (green shade), and referred to here as process cyan. 2. As a digital colour, the distinctly more greenish blue-green hue produced when the B and G components are equal, and referred to here as digital cyan. Divisionism. Painting style in which colour is “broken” into dots etc. of saturated or “spectral” components. Dominant wavelength. "wavelength of the monochromatic stimulus that, when additively mixed in suitable proportions with the specified achromatic stimulus, matches the colour stimulus considered in the CIE 1931 x, y chromaticity diagram" (CIE e-ILV 17-345). Any mixture of wavelengths can be matched in colour by a mixture of white light and a light of its dominant wavelength. Dye. Soluble colorant (as opposed to insoluble colorants, called pigments). Edge spectra. Spectra produced by progressively removing wavelengths of light beginning at the short- (white-yellow-orange-red) or the long- (white-cyan-blue-violet) wavelength end. Fluorent. Having the appearance of physical fluorescence See Part 1.8. Fluorescence. "emission of optical radiation (light) when a substance is exposed to any type of electromagnetic radiation, where the emitted radiation generally appears within 10 ns after the excitation" (CIE e-ILV 17-456). When invisible ultraviolet radiation is absorbed and the energy re-emitted as light an anomalously bright appearance results. When the emitted radiation appears after a greater delay the phenomenon is known as phosphorescence. Gamut. "volume, area, or solid in a colour space, consisting of all those colours that are either: (a) present in a specific scene, artwork, photograph, photomechanical, or other reproduction; (b) capable of being created using a particular output device and/or medium" (CIE e-ILV 17-211), for example, the range of colours obtainable by mixing a given set of paints. Glaze. A transparent layer of paint used to modify the colour of an area. Grisaille. Painting or paint layer using only more or less achromatic paints of different values. Halation. Appearance of light spreading out, for example from a light source viewed in dark surroundings. Half light. Planes moderately to strongly inclined to the light source, between the full light and the terminator, and thus reflecting noticeably less light than the full light. See Part 2.2. Helmholtz-Kohlrausch phenomenon (or effect). "change in brightness of perceived colour produced by increasing the purity of a colour stimulus while keeping its luminance constant within the range of photopic vision" (CIE e-ILV 17-531). For example on a Munsell hue page a horizontal row of chips has the same Munsell value and reflects light of the same luminance, but the higher chroma chips can give an impression of higher brightness and lightness than the lower chroma chips. This impression may be associated with the higher brilliance of the high-chroma chips (See Part 1.8). Highlight. Specular reflection of a light source. See Part 2.1. HLS. Digital colour space classifying RGB colours according to hue angle (H), and rather arbitrary dimensions called “lightness” (L) and “saturation” (S) but unrelated to the standard definitions of those terms. Also called HSL. See Part 1.3. HSB. 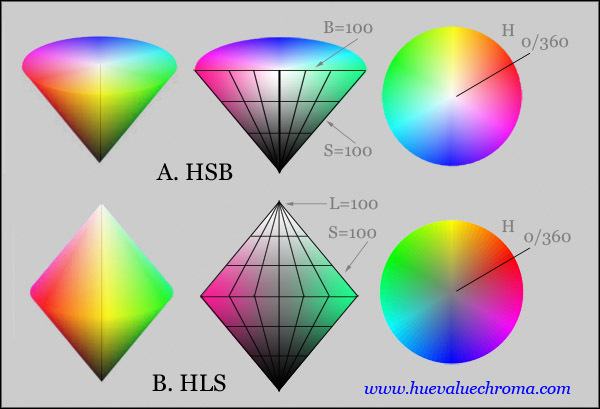 Digital colour space classifying RGB colours according to hue angle (H), relative saturation (S) and relative brightness (B). See Part 1.3. HSV. Digital colour space classifying RGB colours according to hue angle (H), relative saturation (S) and so-called "value" (V). Original name for HSB space of Photoshop. See Part 1.3. Hue. 1. “attribute of a visual perception according to which an area appears to be similar to one of the colours: red, yellow, green, and blue, or to a combination of adjacent pairs of these colours considered in a closed ring” (CIE e-ILV 17-542). Hue is represented by position around a hue circle or “colour wheel”, and is the way in which we perceived an imbalance of the long-, middle- and short-wavelength components of a light relative to daylight or of the spectral reflectance of an object relative to a spectrally neutral reflector (Part 1.4). This direction of imbalance is measured by the psychophysical quantity of dominant wavelength. 2. Of paints, signalling a substitute offered for a generally more expensive pigment, as in "Cadmium Red Hue". 3. (Colloquially) a colour or colour variant. Hue angle. Specification of hue in some colour spaces, including the digital colour spaces HSB and HLS, and in many colour appearance models. Hue page. Array of colours of a single hue, arranged according to colour attributes such as lightness and chroma or blackness and chromaticness. Hue shift. In painting, tendency of a paint to change visibly in hue as a result of thinning or the the addition of white, black or grey paint etc. Also described as an undertone. Hues, spectral. Hues evoked by single wavelengths, in the sequence spectral red, orange, yellow, green, blue, violet. Extra-spectral hues including purple, magenta and middle red.are evoked only by mixtures from the two ends of the spectrum. See Part 1.4. Hue, unique. “hue that cannot be further described by the use of hue names other than its own. There are 4 unique hues: red, green, yellow and blue forming 2 pairs of opponent hues: red and green, yellow and blue” (CIE e-ILV 17-1373). Also known as opponent hues, unitary hues, or psychological primaries. Illuminant. 1. In a restricted sense, "radiation with a relative spectral power distribution defined over the wavelength range that influences object colour perception", for example the various CIE standard Illuminants such as D55, D65 etc. Light. 1. Electromagnetic radiation able to excite the human visual system. (The expression “visible light" is redundant). 2. Our visual perception of electromagnetic radiation, sometimes distinguished as perceived light. See CIE e-ILV 17-659. Lightfastness. Resistance to colour change on exposure to light. Lightness. 1. "brightness of an area judged relative to the brightness of a similarly illuminated area that appears to be white or highly transmitting" (CIE e-ILV 17-680). Measures of lightness include Munsell value and CIE Lightness L*. 2. "Lightness" (L) in HLS space is a kind of relative lightness in which the highest-chroma colour at each hue angle has L=50. See Part 1.3. Luminance. Visible energy of light, that is, physical light energy weighted according to the wavelength-by-wavelength response of the human visual system. For technical definition see luminance (CIE e-ILV 17-711) and luminous flux (CIE e-ILV 17-738). Since the 1943 renotation, Munsell chips of a given value are designed to reflect light of equal luminance under a standard daylight illumination (Illuminant C). Luminous colour. “colour perceived to belong to an area that appears to be emitting light as a primary light source, or that appears to be specularly reflecting such light” (CIE e-ILV 17-727). Lustre. Appearance of a material related to the way light interacts with its surface. Terms used to describe lustre include glossy, matte (dull), vitreous (glassy), adamantine (sparkling), metallic, greasy, waxy and silky. Metameric colour stimuli. “spectrally different colour stimuli that have the same tristimulus values in a specified colorimetric system” (CIE e-ILV 17-768). Metameric lights that evoke an identical white perceived colour can have wildly different spectral compositions. Paint mixtures that match under one illumination but are made from different pigments may have different spectral reflectances and may not match under a different illumination. This breakdown of colour matching between physically different materials under different illuminations is called metameric failure. Monochromatic. 1. Radiation characterized by a single wavelength or a very small range of wavelengths (CIE e-ILV 17-788). 2. Colour scheme of an image or design made up of colours of a single hue but usually varying in other colour attributes. “Muddy” colour. Colour felt to exhibit too much blackness for its context in a painting (compare "chalky" colour). Munsell system. Classification of object colours in terms of specific scales of hue, value (lightness) and chroma. See Part 1.1. Neutral. 1, Achromatic, in the sense of being either a colorimetric neutral ("having the same chromaticity as the adopted white", CIE e-ILV 17-194) or spectrally neutral ("exhibiting reflective or transmissive characteristics, which are constant over the wavelength range of interest", CIE e-ILV 17-1233). 2. In interior design, colours in the achromatic to low chroma range. Non-luminous colour. "colour perceived to belong to an area that appears to be transmitting or diffusely reflecting light as a secondary light source" (CIE e-ILV 17-818). Object colour. “colour perceived as belonging to an object” (CIE e-ILV 17-831). Opponent hues. See Hues, unique. Optical mixing. Appearance of two or more coloured stimuli as a single colour because they cannot be separately distinguished, for example due to small size or rapid motion. See Part 4.4. Optimal colour stimuli. "object colour stimuli corresponding to objects whose luminance factors have maximum possible values for each chromaticity when their spectral luminance factors do not exceed 1 for any wavelength. ... For a given luminance factor, these colour stimuli define the maximum purity possible for non-fluorescent objects” (CIE e-ILV 17-851). Paint-mixing path. Path of a mixture of paints through colour space. See Part 6.3. Palette. 1. Surface used for paint-mixing. 2. The set of paints used by a painter. Palette, double or split primary. Palette consisting of six paints corresponding to a “warm” and a “cool” version of each of the three historical primaries, red, yellow and blue. See Part 6.2. Palette, limited. Palette chosen to provide a deliberately restricted gamut of colours. Penumbra. Transitional zone at the edge of a cast shadow, typically broadest where it is furthest from the object casting the shadow. See Part 2.3. Permanence. Resistance to colour change on exposure to light and atmosphere. Primaries. 1. Abbreviation of the expression "primary colours". 2. In additive colour technology and colorimetry, “primaries” include both specific physical lights and virtual lights derived mathematically from these (e.g. CIE XYZ). Primary colour. 1. Hues considered basic or simple in some system, such as the historical, additive, ideal subtractive or psychological primaries. 2. Less commonly, the specific paints of a painter’s palette. Primary colour, additive. Optimal hues of lights in additive mixing technology: typically orange-red, yellowish green and blue or violet-blue, but generally known simply as "red", "green" and "blue". See Part 4.1. Primary colour, historical. Primary colours of traditional colour theory: red, yellow and blue, held to be unmixable from other colours but yielding all other colours by mixture. See Part 6.2. Primary colour, psychological. Alternative name for the four unique hues: red, yellow, green and blue, reflecting the relatively early adoption of the concept of hue opponency by psychologists around the close of the nineteenth century. Primary colour, optimal subtractive. Optimal hues of colorants for subtractive mixing processes. These coincide broadly with digital cyan, magenta and yellow (Part 5.2). Reflectance. Ratio of the reflected radiant flux or luminous flux to the incident flux in the given conditions (CIE e-ILV 17-1058). Luminous relectance = reflectance of visible radiation i.e. light. Diffuse reflectance = ratio of the diffusely reflected flux to the incident flux of radiation (CIE e-ILV 17-304). Reflection. diffuse. “diffusion by reflection in which, on the macroscopic scale, there is no regular reflection” (CIE e-ILV 17-305); also called body reflection, as opposed to specular or regular reflection. Most materials exhibit diffuse and specular reflection simultaneously. Reflection, specular. “reflection in accordance with the laws of geometrical optics, without diffusion” (CIE e-ILV 17-1077, as “regular reflection”), for example producing the highlights a glossy surface, or the image in a mirror. Also called regular or interface reflection. Related colour. "colour perceived to belong to an area seen in relation to other colours" (CIE e-ILV 17-1080). Hunt states that light-reflecting objects in ordinary viewing condition are usually seen as related colours (emphasis mine) and that self-luminous objects (e.g. traffic lights) are usually perceived as unrelated colours, but he implies that some self-luminous or transmitting objects (a television screen or a stained glass window) can be perceived either as related or unrelated colours (Hunt and Pointer, 2011, pp. 12, 329). Fairchild (2013) in contrast classifies almost all colour appearances as related, restricting the term "unrelated" to stimuli viewed in complete physical isolation (that is, through an aperture against a dark background). Saturation. 1. “colourfulness of an area judged in proportion to its brightness” (CIE e-ILV 17-1136), in effect the perceived concentration of chromatic as opposed to white light in the light coming from an area. Saturation is thus the inverse of whitishness of a light. As objects are perceived to reflect light of about the same saturation through a wide range of illumination levels, object colours can also be characterized as saturated (for example both vermilion and dark ruby red) or desaturated to various degrees. Saturation is the way in which we perceive the psychophysical quantities of colorimetric purity or excitation purity (CIE e-ILV 17-195, 17-408), which measure in different ways the proportional imbalance of the long-, middle- and short-wavelength components of a light relative to daylight. See Part 1.7. 2. Widely used as a generic term for chromatic intensity in contexts where chroma, colourfulness, saturation and other aspects of chromatic intensity are not distinguished, including various digital colour spaces and applications (3-5 below). .
5. In the definitions of the Hue, Saturation, Color and Luminosity layer modes in Photoshop,"saturation" means either Lab chroma (when used in Lab mode) or YCbCr chroma relative to the maximum possible for colours of the same hue angle (when used in RGB mode). Scattering. “process by which the spatial distribution of a beam of radiation is changed when it is deviated in many directions by a surface or by a medium, without change of frequency of its monochromatic components” (CIE e-ILV 17-1139). Also called diffusion. Secondary colour. In traditional colour theory, a hue considered to contain two of the three historical primary hues (red, yellow and blue) and placed midway between those hues on a colour wheel. Shade. 1. Paint mixture made from a colorant or colourants plus black paint, without any white paint. 2. Object colour perceived to consist of a full colour and black, without any white content (whiteness). Shading series (or shadow series). Series of colours of uniform hue and saturation, but differing in lightness and chroma. Appropriately arranged in an image, such colours will be seen as a uniformly coloured object under variable lighting (see Part 10.1). Simultaneous contrast. Perceived increase in colour difference when coloured areas are juxtaposed. See Part 3.5. Spectral power distribution. Spectral distribution of light expressed as power per wavelength interval. Spectral distribution can also be expressed in terms of luminous or photon quantity per wavelength interval (CIE e-ILV 17-1213). Spectral reflectance curve. Graph showing the reflectance of an object at each wavelength of the spectrum. Spectrum. "display or specification of the monochromatic components of the radiation considered" (CIE e-ILV 17-1238). Term originally introduced by Newton for the rainbow-like band of light produced by splitting a beam of sunlight using a prism, but see also edge spectra. Subtractive mixture. Process in which two or more colorants or filters each remove wavelengths from the same light. Thus mixing coloured paints involves subtractive mixing, but spinning painted discs does not. Subtractive mixture is a major factor in paint mixing but is usually accompanied by additive-averaging mixture. Successive contrast. Influence of a negative afterimage on the perceived colour of an area. Terminator. The limit of the direct fall of light on an object. See Part 2.2. Tertiary colours. Historical term now restricted to traditional colour theory, where it has two conflicting meanings. 1. Three-component colours, meaning greyed (low-chroma) colours, considered in traditional colour theory to “contain” all three of the historical primary colours, red, yellow and blue. First employed for such colours by Field (1817). 2. Third-order colours, that is the six colours that lie between adjacent primary and secondary colours in a 12-hue traditional colour wheel, and considered in traditional colour theory to “contain” just two primaries in unequal proportions. First employed in this sense by Ruskin (1877). Tint. 1. Paint mixture made of a colorant or colourants plus white paint, without any black paint. 2. Object colour perceived to contain a full colour and white, without any black content (blackness). Tinting strength. Power of a paint to influence the colour of mixtures. Tone. 1. Colour attribute related in meaning to lightness/value, but commonly held to increase with decreasing lightness. 2. In traditional colour theory, an object colour perceived to consist of a pure colour plus black and white, that is, all colours on a hue page except the tints and shades. Tonal massing. Traditional compositional strategy of grouping values into distinctive shapes in order to create a more striking or expressive composition (for example, see Loomis, 1947, Part 2, Tone). Trichromatic model. Model of human colour vision postulating three types of receptors in the retina. Undertone. Colour of a paint when spread thinly over a light ground or mixed with white. Unrelated colour. "colour perceived to belong to an area seen in isolation from other colours" (CIE e-ILV 17-1376). Hunt held that light sources, for example traffic lights, are usually perceived as unrelated colours because they can not be compared with a similarly illuminated white, and therefore are not perceived to exhibit lightness or chroma (Hunt and Pointer, pp. 12, 329). Fairchild (2013) in contrast restricts the term "unrelated" to stimuli viewed in complete physical isolation (i.e. through an aperture against a dark background). Value, or greyscale value. 1. Alternative name for lightness. 2. Lightness measured on the Munsell value scale. Value, home. Value at which a hue reaches its maximum chroma; also known as peak chroma value. Mainly a painters term used in relation to the gamut of paint mixtures. "Warm" colours. Colours deemed in traditional colour theory to have a psychological association with warmth (see colour temperature). In various accounts the warmest hue is usually at or near orange but ranges from yellow to red. Whiteness. The perceived amount of white in an object colour relative to pure white.